Senior center Pierce Deamer passes the ball during a men's water polo game in October. As a program with just four winning seasons in the past 17 years, men’s water polo reached its peak performance Saturday afternoon. Head coach Barry King and his players said the Colonials’ 15–13 overtime loss to Harvard in the first round of the NCAA tournament was a satisfying cap to a season of improvement and a good outcome for the seniors. This season will serve as an important building block for the future of the team, they said. 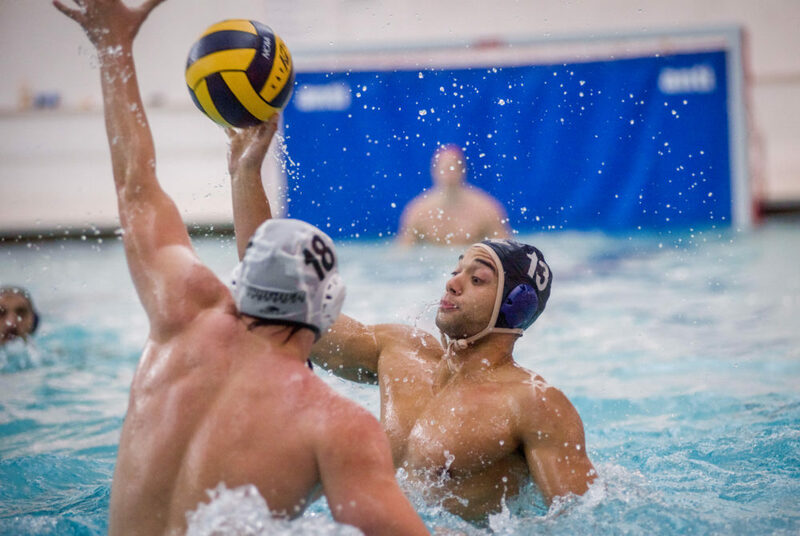 GW’s appearance in the NCAA tournament was its first in program history after the team went 17-12 on the year and won its first conference championship in the Mid-Atlantic Water Polo Conference final over Wagner. The team finished with a No. 17 ranking in the College Water Polo Association’s national poll. To reach the games late in November, the Colonials worked through some hurdles over their nearly three-month season. King, who was hired in July and arrived at GW only two days before his team began its preseason action, said the time crunch forced him to learn about his players during the season. To start the year, GW won each of its first three games, but then went the following two months without stringing together more than two victories. The Colonials played the Crimson three times during the regular season and lost all three contests, but Deamer said the out-of-conference contests did not fully reflect the squad’s abilities. Following an 0-4 showing at the Harvard Invitational in October, GW defeated its opponents in seven straight contests, including all three of its conference matchups. The Colonials were tested most in the MAWPC semifinal against Fordham when they trailed by two goals in the last quarter and needed overtime to defeat the Rams 16–15. King said he was pleased with his team’s late-season run because it was a “culmination” of the work they put in and the understanding that they grew during the year. For a team who returned nine of its top-10 point contributors and made it to the 2016 conference final, this year’s success did not come as a surprise – but it did provide GW’s four-man senior class with a distinctly different experience from how they began their time in Foggy Bottom. In 2014 and 2015, the Colonials combined for 1-15 in conference play and failed to win a game at the Smith Center while changing coaches between seasons. Deamer said this year’s seniors were able to gain knowledge from those challenges that they tried to pass along to the newcomers. King, who previously coached women’s water polo at Indiana for 19 years, said this season ranks among his best in terms of the “satisfaction” he was able to help deliver to the seniors in their final go-round. Despite some important losses to graduation, players said they expect the winning to continue and hope next year they can further extend their season. Destici led the team in points (135) and set a program record with 77 assists on the season. Sophomore Andrew Mavis led the team in goals with 81, followed by freshman utility player Andras Levai with 67. Junior Austin Pyrch and freshman Vaios Vlahotasios split time on net, combining for 322 saves. King said he hopes the team’s young core and recent national contention can establish GW as “that program in the east” in his years at the helm.